The Parmalee trail is located in the Mount Falcon Park near Morrison, Colorado. 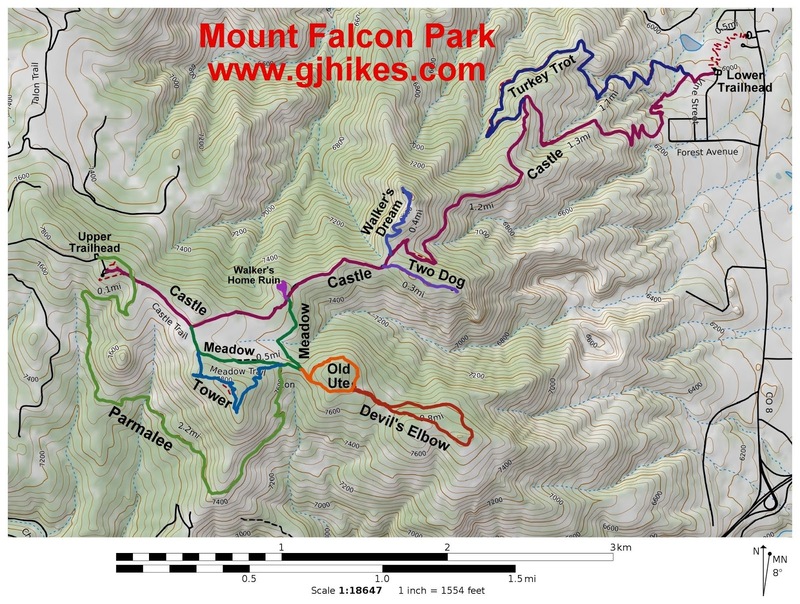 The trail begins off of the parking area at the upper trailhead where it descends around the south side of Mount Falcon (7,851 feet) losing about 500 feet of elevation in the process. 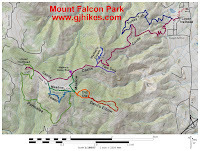 After crossing a gulch the trail begins gradually gaining back much of the elevation as it wraps around Mount Falcon and comes to an end at a junction with the Meadow trail. The Parmalee trail begins on the north side of the parking area. Free maps are available from a box that are useful for planning routes out of all the interconnecting trails in the area. As the trail starts out it follows an easy route that leads around the north edge of the hill. After a short distance the trail turns south and crosses the Castle trail. Restrooms can be found off to the left at this point as well as a kiosk with more trail maps. The trail breaks over the grassy hill and sweeps around the first of several switchbacks as it begins its descent. After the trail makes its initial plunge the descent becomes more gentle. Grassy open spaces are mixed in with the tall stands of ponderosa pines adding a bit of variety to the trails pleasant scenery. The slope increases as the trail works its way around the side of the first hill. The lowest point of elevation comes as the trail crosses the drainage that channels the water down the west side of Mount Falcon. After crossing the drainage it is all up hill to the finish. The east end of the Parmalee trail is a couple hundred feet lower than the west end so heading in this direction should prove to be a bit easier. A long stretch of the trail travels out in the open on the more easterly side of the mountain. The Parmelee trail comes to an end as it reaches the ridge and meets up with the Meadow trail. From here you can go to the left and get back to the trailhead either via the Meadow trail or the Tower trail. Following the Meadow trail to the right provides access to the Old Ute and Devil's Elbow trails enroute to its junction with the Castle trail. A map comes in handy for planning various routes that are available. Hikers, trail runners, mountain bikers and horseback riders should all find the Parmalee trail to be a good option for an outing. If you would like to see it for yourself then all you have to do is 'Take a hike'.